Oops! Followed by expletive of choice! 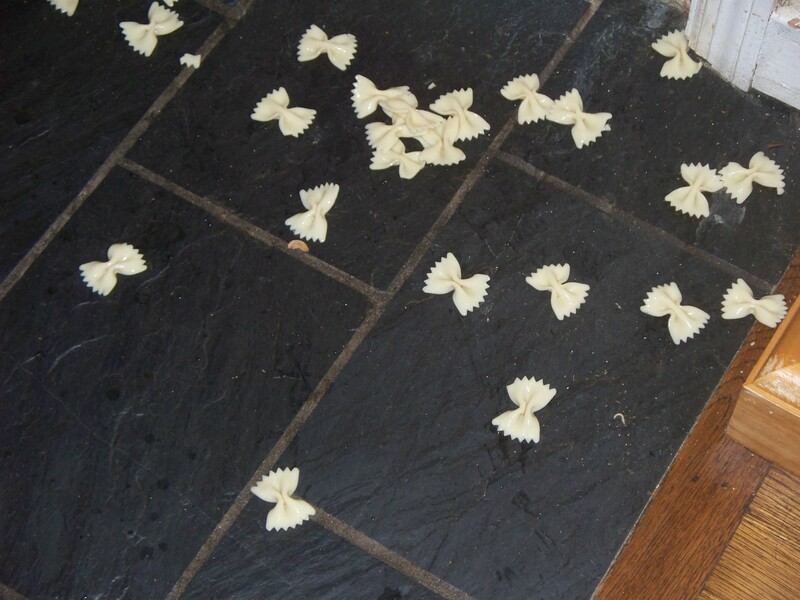 The black slate floor of my hallway was littered with cream colored bowties – talk about a night at the Oscars! Known to the English-speaking world as bowtie pasta, farfalle is a festive little carbohydrate. After cooking them for dinner and plating them in a cobalt blue bowl. I was heading down my hallway to the den (yes, I was planning to eat in front of the television – I know, bad, bad Misti) when I remembered I needed something in the pantry. Quick turn around and whoosh! Bowties a-flying! dog Tallulah, my neighbor’s cat Emily, and myself walking up and down that hallway daily there was no thought of salvaging, although Tallulah did manage to nab a few pieces of pasta before the paper towel clean-up began). Fortunately there was a little more pasta in the pot so I started over, mixed in a little Boursin herbed cheese which when melted over the pasta turns into a great cheese sauce. Boursin is a rich, sweet, cow’s milk cheese similar to cream cheese in taste. I then ground a little fresh black pepper over the top. Easy dish for a spring evening! A salad with grape tomatoes, sliced yellow bell pepper, cucumber, spring onion, and a quick balsamic vinaigrette was a good start to the meal. With this dinner I served my “house wine,” a 2008 Bogle Old Vine Zinfindel.